The cream/yellow marginal variegation accounts for the name of this plant which is a hybrid of H. 'Bold One' × H. 'Bold Ribbons'. It was registered by Paul Aden of New York in 1979. For some reason, this plant was re-registered in 2010. 'Wide Brim' is a medium size plant about 18 inches high by 45 inches wide. The leaves are moderately corrugated, wavy and broadly ovate shaped with good substance. Pale lavender flowers bloom from late July into August followed by viable seeds. 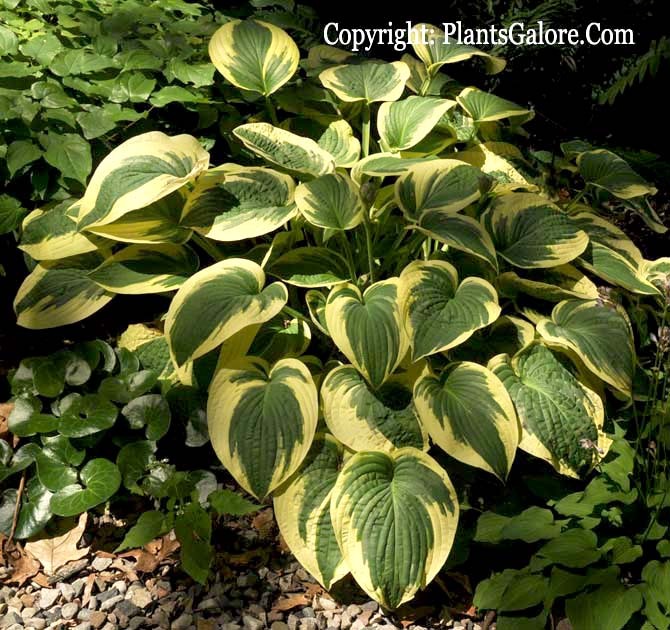 The New Encyclopedia of Hostas by Diana Grenfell (2009) states: "Increases rapidly. 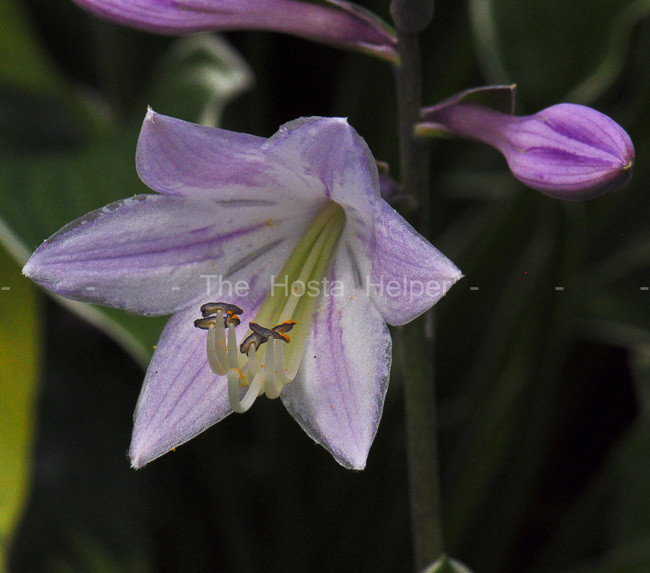 Very popular with flower arrangers because of the pleasing outline, the rugosity, the distinctive wide margin, and the contrasting dark base color...A classic hosta." An article by Warren I. Pollock in The Hosta Journal (1997 Vol. 28 No. 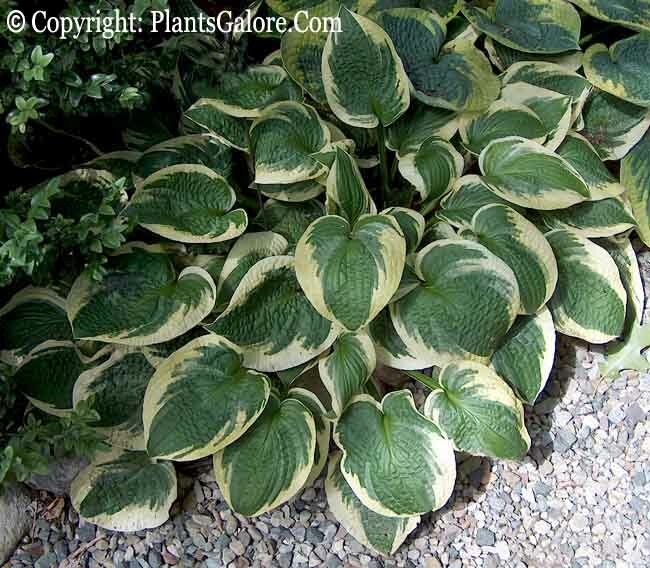 1) states that, "H. 'Stetson' is a mutation of - and with the same variegation as - 'Wide Brim' a classic hosta, certainly a must have cultivar for any hosta fancier...The difference between the two hostas is that each side of the leaf blade of 'Stetson' curves (curls) upward." Plant: 30 in. (76.2 cm) diameter; 20 in. (50.8 cm) high. Leaf: 20 in. (50.8 cm) long; 4.5 in. (11.4 cm) wide; 18 vein pairs; green center; white margin. Flower: pale lavender; bell; Baldwin, NY; July 20 to Aug. 15. Clump History: original seedling; Baldwin, NY. Plant: 45 in. (114.3 cm) diameter; 18 in. (45.7 cm) high. Leaf: 8.5 in. (21.6 cm) long; 6 in. (15.2 cm) wide; 10 to 12 vein pairs; medium to dark green; 1 to 2 in. (2.5 to 5.1 cm) wide, wavy, creamy yellow margin; light glaucous bloom underneath, broadly ovate; moderately corrugated. Scape: 24 in. (61 cm) long. Flower: 2.125 in. (5.4 cm) long; pale lavender; bell; Baldwin, NY; July 21 to Aug. 10. Seasonal Variation: margin turns creamy white during the season.